My other ‘proper’ job is in a retail shop in a big shopping centre, now in this shopping centre there is a gym on the top level, the bottom level is the car park and the middle level is where all the shops are. Every Saturday my family and I park in the underground car park and catch the lift up to the shops, we have to catch the lift as my two boys love pressing the buttons on the lift and also my eldest was scared of the travelator for awhile there. Anyway, it amazes me just how many people I see waiting with us to catch the lift up to the gym. I mean, you’re there to exercise right? Walk up the travelators! I just don’t get how lazy people get when going to the gym! Sometimes that lift plays up and breaks down, but those gym people will wait it out, wouldn’t want to do any extra, non-essential exercise now would you? 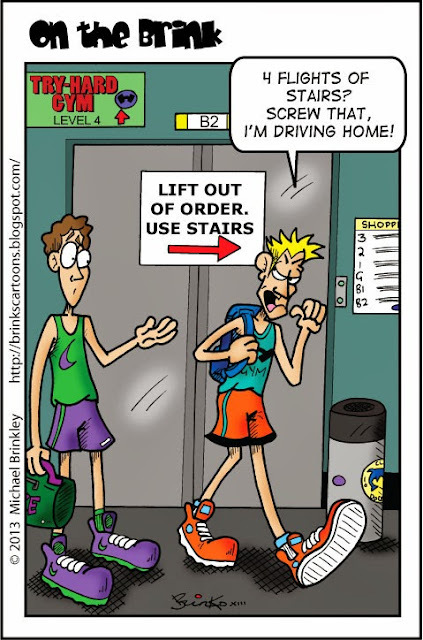 So as you could probably guess after waiting a long time for the lift one day (It was broken, but the guy still waited and eventually we all bailed and took the travelator) with one of these gym guys, this idea came to me as I pondered just how lazy someone going to the gym could get.